This beautiful set of 6 demitasse is brought to us by Nuova Point of Italy. Each cup features a different Italian city: Napoli, Bari, Bologna, Venezia, Catania and Milano; if you love one of those cities, that one will surely be your favorite cup! Heavy thick walled porcelain keeps your coffee warm longer; 2oz. capacity; cups are 2.25" high, 2.25" wide Dishwasher safe. 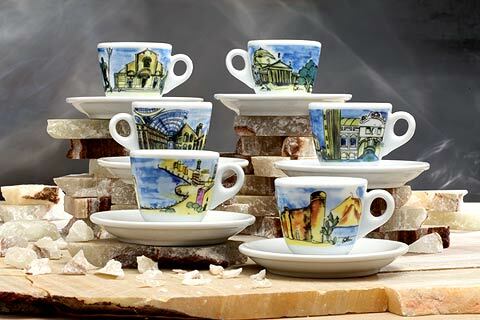 Made in Italy..
Click the button below to add the The Italian City Scenes Espresso Cups Set of 6 to your wish list.